In the past few years, equity factor investing has become increasingly popular among institutional investors and their managers. Professor of Finance at EDHEC-Risk Institute and CEO of ERI Scientific Beta. Head of Applied Research at EDHEC-Risk Institute. Senior Research Engineer at EDHEC-Risk Institute. At the start, and following the work of Ang et al., one of the motivations for smart equity factor investing was to replace active managers who were considered costly with indices representative of a choice of factors that were well rewarded over the long term. • Replacing the core passive cap-weighted benchmark with a multi-factor benchmark. More recently, factor investing has given rise not only to total or partial substitutions of active managers or cap-weighted benchmarks but to implementation of dynamic long or long/short strategies that aim to set up genuinely original factor allocation solutions that are referred to as active in the sense that they aim to produce performance compared to static single or multi-factor indices. 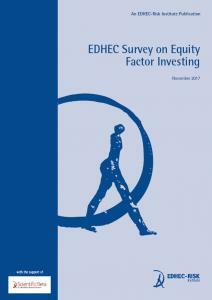 The goal of this survey is to learn and understand the interests and motivations for investing in these new forms of equity factor strategies.